Eyas Landing provides multi-disciplinary therapy services for children and adolescents in need of occupational, speech, developmental, physical, feeding, behavior, or ABA therapy. Eyas Landing is committed to offering the highest possible standard of care in order for clients to thrive and meet their goals. Therapists collaborate across disciplines and with client families to create an ideal treatment plan. Eyas Landing therapists provide support in the home and community setting. Home environments facilitate caregiver training and education on behavior management and sensory processing difficulties. Additionally, home services increase participation in home and community activities, including but not limited to dressing, bathing, grooming, eating, and going to the store. Therapists and caregivers form a collaborative team for approaching successful strategies related to home and community activities. 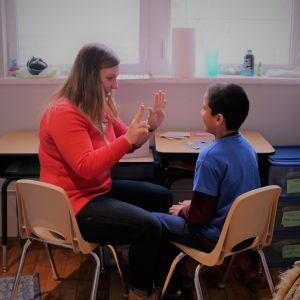 For children and adolescents who need extra support at school, Eyas Landing therapists are available to provide a wide range of services in the classroom. We will develop an individualized program that meets a client’s needs and accommodates specific scheduling requirements of both the school and client — even if the school that does not have a partnership arrangement with Eyas Landing. Eyas Landing now features TeleHealth services, which uses telecommunication techniques to provide clients with therapeutic counseling over the Internet. Through TeleHealth, we transmit voice, data, images, and information directly to each client’s computer. TeleHealth’s interactive patient experience solutions enables clients to play a more direct role in reaching specific health and wellness goals. Eyas Landing provides intensive therapeutic services to augment existing therapy services. Intensive therapeutic services are a structured schedule created to provide a multidisciplinary and collaborative approach fitting each client’s specific needs. These therapeutic plans target the essential skills needed to form independence and are based on therapist recommendation and family’s availability. Intensive therapeutic services are highly successful with generalizing skills at home and in the community. The Merlin Program at Eyas Landing is a therapeutic program designed in a school setting for children ages 6 and up. The award winning curriculum that is regularly used across Chicagoland is easily modified to fit each individual child’s needs. Children will be exposed to group instruction and social interactions along with individual care with a ratio of 2:1 or 1:1. This structure is similar to the successful therapeutic preschool and kindergarten readiness program at Blue Bird Day and is intended as the next step in that process, based on age and development. Sister company, Blue Bird Day, is a therapeutic preschool and kindergarten readiness program. Two convenient locations in the West Loop and Northcenter are available and open for enrollment. Contact Blue Bird Day for more information.